Villa Hatira is located opposite a park and just 5 mins stroll from the end of the main street of Dalyan with its many shops, bars and restaurants. Enjoy the view of the famous rock tombs from the bedroom balconies or the veranda whilst enjoying that al fresco meal or watching the sunset over the nearby mountain. Or enjoy a barbecue on a warm evening whilst sitting in one of the 2 outside seating areas. The private garden has many fruit trees including lemon, banana, orange and olive as well as numerous flowering shrubs which make the garden at villa Hatira very private. Dalyan has much to offer the traveller whether you enjoy relaxing by the pool with a good book or 'strolling over history' at nearby Caunos with its Roman ruins. Or you may prefer to hire a boat and go out to sea to visit the many coves whilst enjoying a barbecue on board, or upstream to the lake to visit a nearby market with a stop at the sulphur baths and again a barbecue on board. Dalyan has it all. We started holidaying in Dalyan in 1992 and have never looked back. Our first property, villa Rahat, was purchased in 2000 along with the land that villa Hatira is built on. In 2003 we purchased Keci Evi which then was a local house with no facilities. 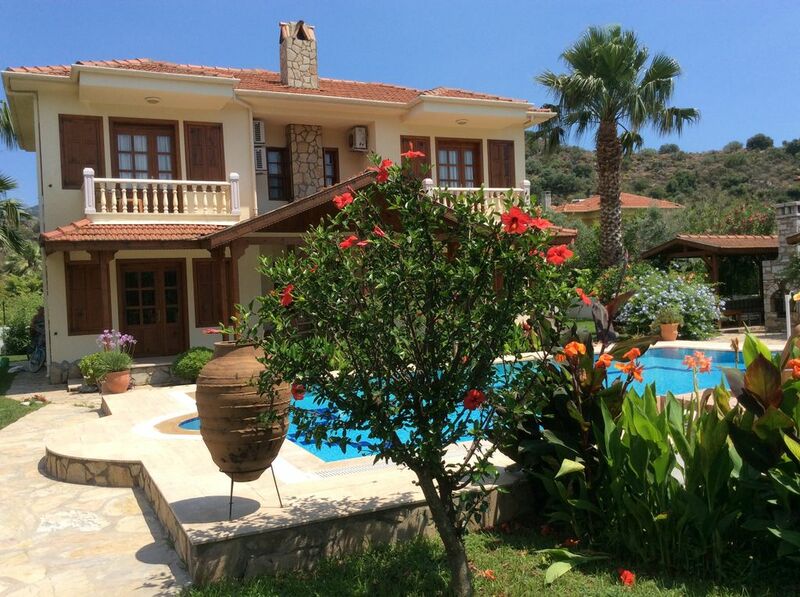 The owners wanted to move into Dalyan so were happy to sell. Restoration started late in 2009 once all the permissions were obtained. We now own another beautiful home, one which we will eventually retire to. We hope all our guests will enjoy this wonderful place. This year we have now formed a company called Turkish Villa Holidays Ltd and are very excited about this and have started managing villas for owners other than ourselves hence Villa Yaz and Villa Yasemin. We still believe strongly in that personal touch. The land on which we built villa Hatira was in an ideal position, on the edge of Dalyan and yet only five minutes walk to the main street of Dalyan with all the shops, bars and restaurants. The promise of a park being built to the front of villa Hatira also appealed, better a park than villas we thought. No car is needed as everything is within walking distance of villa Hatira whether it's a boat trip out to sea or up to the lake, or a visit to the ancient city of Caunos located across the river from Dalyan and reached by rowing boat and a short walk. All bedrooms have their own large wet rooms with shower, basin and WC. Indoor towels only. Please bring your own outside and beach towels. Notes on accommodation: Electricity is very expensive in Turkey. We therefore ask guests to be mindful of this. Outside: The garden at Villa Hatira is for the sole use of our guests as is the pool. We provide sun beds with cushions as well as a cushioned shaded seating area. The veranda has a table and seating for 6 as does the second shaded seating area which is located next to the barbecue. Utility Room: The washing machine is located in the understairs cupboard as is the hot water system which ensures a constant supply of hot water. Cleaning / Towels / Linen / Maid service: Linen is included, however we do ask guests to bring their own beach, and outdoor towels. A midstay cleaning service is also provided for bookings of more than 7 days. Cots can be hired. We can arrange transfers. The cost is paid locally by guests. Other: Villa Hatira does not have a TV instead there is a small library and games for guests to enjoy. We also have a CD player and radio. Iztuzu beach or Turtle beach is renowned as a nesting site of the Loggerhead Turtle and as such the beach is closed between 20.00 and 08.00 There is also no building allowed on the beach apart from a small cafe and toilets. Seating is also restricted to hired sun beds. During the day the river taxis will take you to the beach through the reed beds. This takes about 20 minutes. Or you can use the dolmus which will take you to the other end of the beach. This journey takes about 15 minutes. Dalaman is the local airport which is 25 minutes transfer time to Dalyan and villa Hatira. We can arrange a transfer for our guests. this is then paid locally at our agents office in Dalyan. Dalyan's attractions are all within walking distance of villa Hatira. Or you may prefer to use the local boats or taxis to get to areas outside Dalyan. The ruined city of Caunos can be reached first by rowing boat and then by a wonderful 20 minute walk which takes you under the famous Lycian rock tombs. Booking Notes: Bookings are accepted with a 10% non-refundable deposit and the completed booking form. The balance is due 6 weeks prior to departure. Cots can be hired locally for a small charge also paid locally. Bedding for cots however is not provided. Changeover Day: We do not have a specific changeover day. We do endeavour to allow guests to remain until their transfer to the airport but in busier times this is not always possible, in this case we arrange for all guests cases to be stored in a safe place.